Abby Fisher (left), a first-year graduate student in speech-language pathology, sees five clients at the Columbia Hall-based Northern Prairie Community Clinic, as part of her supervised practicum this semester. Photo by Dima Williams/UND Today. There are days when Abby Fisher walks into the East Grand Forks Head Start Center, a local early childhood education program, only to instantly hear one of her young charges. His chatter delights her – especially amid the backdrop of his past timid and passive demeanor that would often shun simple questions. 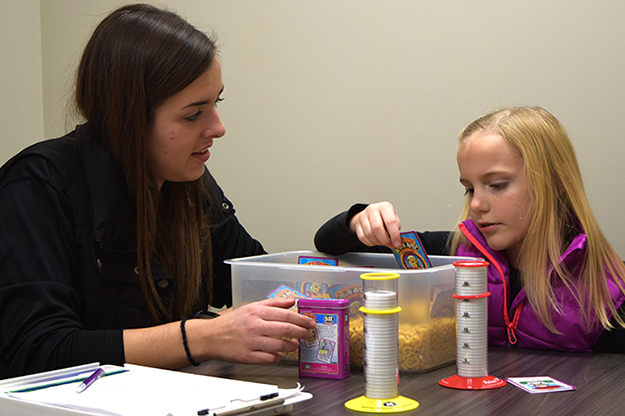 Under the supervision of a UND clinical instructor, Fisher provides speech-language therapy to four children at Head Start on Tuesdays and Thursdays. On Mondays she engages an adult patient at the Northern Prairie Community Clinic (NPCC), where she spends most of her time. The clinic – in partnership with Head Start – molds most of Fisher’s practicum in the first three semesters of her advanced degree. 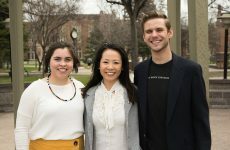 And so it does it for more than 50 other UND students – graduates as well as doctoral candidates – in speech-language pathology, counseling psychology and clinical psychology. 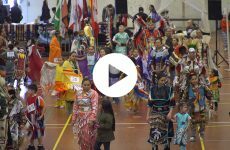 Together, they see hundreds of patients from UND and the surrounding communities. Housed in a polished, sprawling section in the south wing of UND’s Columbia Hall, NPCC affords an immersive training ground for budding health professionals from three departments within two UND colleges. Unlike many other educational clinics, it involves students from their very first term, allowing for more real-world interactions with patients. And, it is paying off. 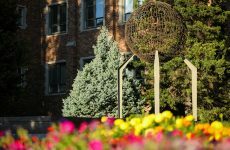 Master’s students in communication sciences & disorders, for instance, have maintained a perfect score on the career-gatekeeping speech-language pathology praxis exam for eight straight years. The national average rate rarely surpasses 90 percent. “My paramount mission is the education and training of our students and quality care for our clients,” said Jessica Foley, communication sciences & disorders professor and one of three clinic directors. To that end, NPCC has flourished after major upgrades over the past couple of years. It migrated from its former grounds in Montgomery Hall to Columbia, where it could provide better access for clients, especially those with mobility impairments. The move also facilitated interdisciplinary cooperation. Whereas in the old facility the three departments occupied separate floors and tended to their own patients, now they are sharing space, learning from each other and striving toward cross-referrals. “One of our main visions is to promote more cross-training because when students get out into the real world they will have to collaborate with other professionals,” said Foley. With formal attempts underway, student clinicians are already casually swapping insights in the common areas where they huddle between patients and classes, Fisher said. Unison brings with it another considerable advantage – the clinic can keep costs low for its community patients and, at the same time, expand its faculties. A case in point is the new video system to record sessions for educational purposes. Students review the tapes together with their supervisors. Patients’ caregivers can also study them to glean exercises and approaches to carry home. Trainees from all three departments also are now able to engage in tele-appointments with clients from across the region, especially in rural North Dakota, where health services often fall short. “Tele-health is really an up-and-coming area,” said Foley. At the clinic, psychology graduate and Ph.D. students work with patients in anger management, family therapy and dyslexia education, among other treatment concerns. Photo by Jackie Lorentz/UND Today. At first, the intensity of the clinic overwhelmed Fisher, who used to observe during her senior undergrad year at UND. Today, she smiles as she talks about her patient caseload. And, it is only poised to grow and diversify with each passing term. During her time with the clinic, Fisher will be expected to delve into disparate ailments and treatments, both in individual and group settings. There is the Toddler Language Circle, the Performance and Recovery in Stroke program, the Language and Literacy group, among a slate of others, that she could be assigned to. 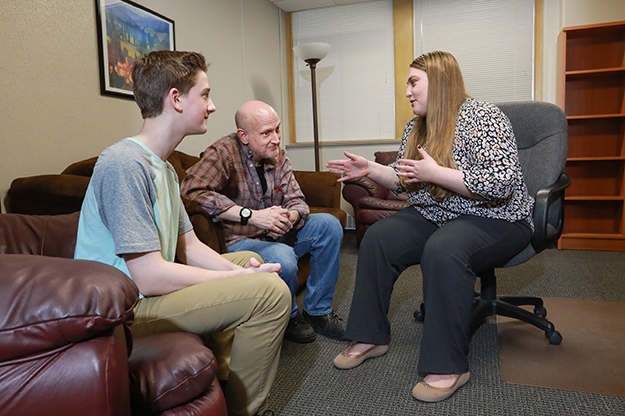 Counseling and psychology students have an array of options, too – from depression diagnosis to anger management to dyslexia education to family therapy. Balancing between the needs of students and patients is no small feat, however. “This means finding a good match between student therapists and clients, while at the same time, making sure all the student therapists are meeting their hours requirements, and engaging in an experience which will help them grow as clinicians and ready them to independently serve clients,” said Melissa Quincer, clinical psychology professor and NPCC co-director.